This is the first in a series of blog posts in which I feature some of the entries for Flow Science’s 35th anniversary contest. Floating structures on an ocean surface, restrained by mooring ropes, are a common sight in the oil and gas industry. Understanding the dynamic response of these structures in the presence of ocean waves is crucial for their structural design. Additionally, each structure is typically made of multiple elements (sub-structures) that interact with each other and the waves. The problem of understanding the dynamic response of a floating structure becomes challenging due to the complex dynamics of the system. A good CFD model should be able to accurately calculate the dynamic response of the floating structure with all of its complex variables in place. In this article, I will talk about the dynamic response of a floating structure made of 3 elements hinged together, followed by a presentation of FLOW-3D simulation results. FLOW-3D can simulate moving objects, generate desired wave types, calculate very accurate free surfaces, and has a robust mooring lines model. All these features make FLOW-3D an excellent tool for estimating the dynamic response of constrained floating structures. Figure 1 (a) shows the details of the floating structure with its 3 elements. The blue and the yellow elements float on the ocean surface, while the red element is submerged. The 3 elements are connected via axial hinge support. The relative motion of the elements is governed by the motion constraints from the axial hinge support, which allows rotational motion along the longitudinal axis of the hinge. Figure 1 (a). Details of the floating structure with its 3 elements colored in blue, yellow and red. Figure 1 (b). 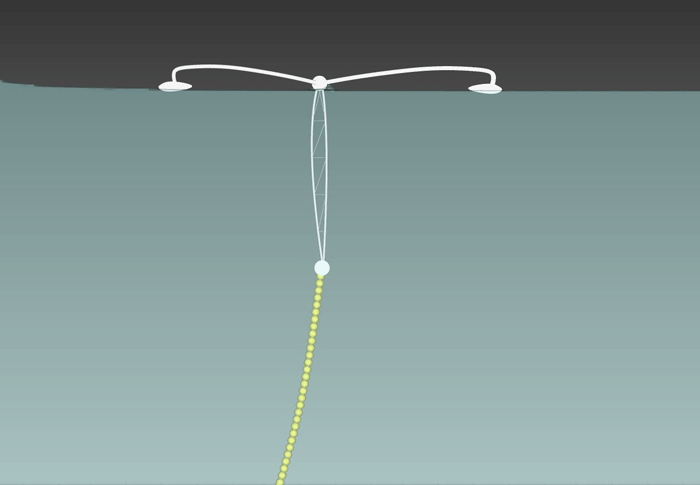 Floating structure relative to the ocean floor and connected to the ocean bottom with a mooring/catenary rope. The model setup of the system is shown in Figure 1 (b). The floating structure is shown in the context of the ocean surface. Also, the red element is tied to the bottom floor using a mooring rope. A wave train is applied at the left boundary. As discussed earlier, FLOW-3D is a natural choice to model such scenarios. In the following sections, I will discuss the details of the important physics involved and FLOW-3D‘s ability to simulate them. FLOW-3D’s moving and simple deforming objects model allows the user to prescribe a type of motion to the elements in a structure. Users can constrain the motion of elements in a certain direction or let the system evolve in a completely coupled way. In this example, motion is constrained in the direction perpendicular to the plane of paper. However, in every other direction, rotations and translations are set to evolve per coupled forces from other elements and the fluid. Users can set a particular type of wave train in FLOW-3D as a boundary condition. Available wave types are Linear, Stokes, Stokes and Cnoidal, Solitary and Random waves. Each of these wave types can be fully defined by specifying wave height, mean fluid depth, wavelength/wave period, and current velocities. Random waves, however, are defined based on a power/energy spectrum and can be allowed to evolve based on the wind speed. In this example, Stokes and Cnoidal waves were used with a wave height of 6m, mean fluid depth of 50m and wave period of 6s. The current velocity is unidirectional from left to right and is set to 0.25m/s. 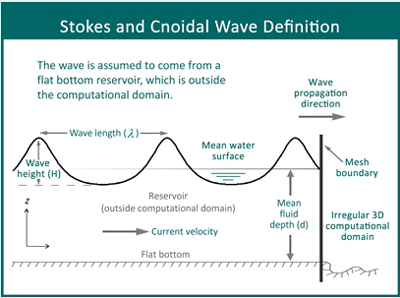 Figure 2 shows the definition of a Stokes and Cnoidal wave. Figure 2. Stokes and Cnoidal wave definition from FLOW-3D. FLOW-3D uses an enhanced variant of Volume-of-Fluid (VOF) technique called TruVOF. TruVOF provides a natural way to capture free surfaces and their evolution with great efficiency. More details on the free surface fluid flow can be found here. FLOW-3D’s Mooring Lines model provides an effective, flexible and robust implementation to accurately simulate the transient dynamic response of floating structures in moored configurations. In addition to basic parameters like free length, linear density, material density and diameter, advanced options such as drag coefficients in normal and tangential directions, and deep water behavior of mooring lines can be set. In this example, a mooring line with a free length of 28m, diameter of 0.2m and a tangential drag coefficient of 0.3 is used. A spring coefficient of 10 6 N/m is provided to imitate the slacking and extension behavior of a rope. The animation below shows the simulation results from FLOW-3D, post-processed in FlowSightTM. The animation captures all the complex physics involved in the process. The top right frame shows the evolution of the velocity of waves. Notice the complex fluid velocity fields around the hinge and at the bottom of the red element. The left frame shows streamlines colored by their relative magnitude. Also, a plot of catenary extension from its free state is shown as the entire structure sways to and fro, causing mooring rope to stretch and slacken. After 20 seconds the catenary extension starts following a steady oscillatory motion. 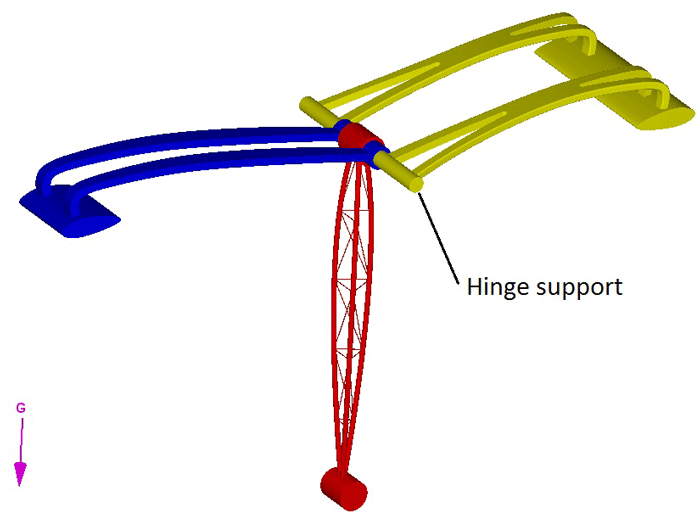 Dynamic hinged motion of three structural elements using FLOW-3D and the oscillating behavior of the constraining catenary extension from the free state. Simulating floating structures involves complex physics and requires a CFD solution that is capable of capturing these physics easily and accurately. FLOW-3D not only gives good results in this case, but the ease with which the entire process can be set up is amazing. In my next post, I will be talking about another 35th anniversary contest entry, applying FLOW-3D to the dispersion of environmental discharges.